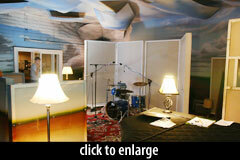 Prairie Sun is one of Northern California’s coolest recording studios. It’s not just the funky rural setting, with the studio spread out across a half-dozen outbuildings that could easily be mistaken for just-another farm… nor the collection of vintage gear that has to be seen to be believed… nor the client list, which runs the spectrum from Paul McCartney to Primus… Rather, it is all of those things together, plus the studio’s 30-year history in one location under the direction of one guy, namely Mark Rennick — known to everyone as Mooka. Mooka and I had only recently met when he mentioned that he might be interested in checking out some new drum overhead mics. I admit it, I get the shakes when someone says drum overhead shootout. I can’t help but immediately start thinking of all the microphones I’d love to put above a drum kit — old favorites and new contenders too. 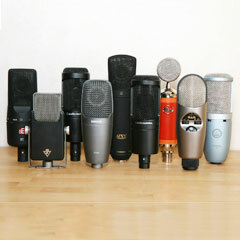 The story, as I understand it, is that the studio wants to retire some of its vintage microphones. The Neumann KM54s, Schoeps M221Bs, the AKG C61s, and so on, all sound great on drums, but there is a high expense to keeping these things sounding as good as they do. I think Mooka wanted to know if something contemporary would suffice — with the added benefit of not being impossible to replace if one inadvertently hits the ground. The Mojave Audio MA-101 FET was designed by David Royer. It’s sort of a small-diaphragm version of the company’s MA-201 FET, with a clean/neutral amplifier circuit coupled to an oversized Jensen output transformer. The Nevaton MC49-C is a Russian mic; it is the Cardioid version of the Omni SDC that Slau thought sounded as good as his Schoeps CMC6 (see his Nevaton microphone review). The Earthworks Audio SR40 is the company’s ultimate Cardioid condenser: pristine electronics mated to hand-selected and tuned 9mm electret capsules, with a flat frequency response (±0.5dB) from 30Hz–40kHz. If you want honest overheads, this is your microphone! The SE Electronics sERN 17 is the second mic to come out of Rupert Neve’s collaboration with sE. The bulge in the body houses a large Neve output transformer. The capsule is a new design, and is detachable. We used the Cardioid capsule for this test. 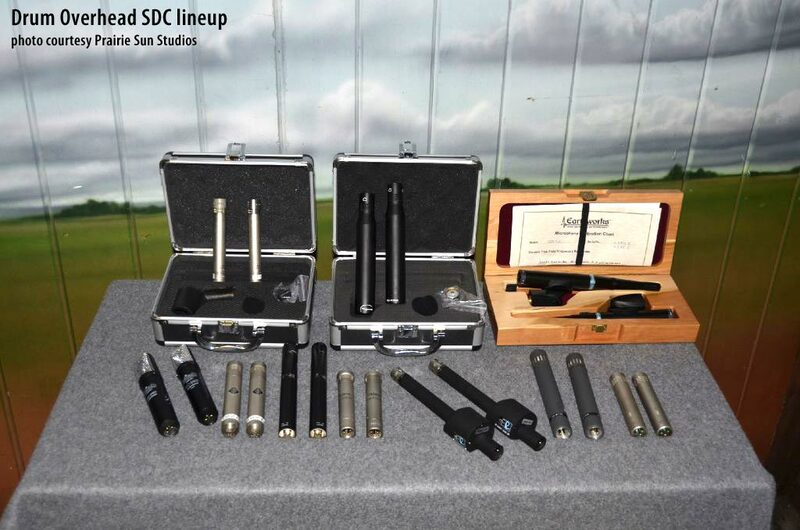 The last set of mics was not matched; it was a hybrid pair comprised of a Milab DC-96C and DC-96B. The thing to know about the Milab DC-96 microphones is that the diaphragm is rectangular. The short dimension (19mm) is said to retain the fast transient response of a small-diaphragm capsule. The Neumann KM 85 is a really interesting microphone. You are probably familiar with its more-famous sibling, the KM 84, thought by many to be one of the finest FET SDCs ever made. If you were to take a KM 84 and strip away the low frequencies — roll off 4dB/octave below 500Hz — you’d have the KM 85. It was designed to compensate for low-end rumble and proximity effect. And, as a result, the KM 85 is the most unique sounding mic in this test. The Neumann KM 54 is a true classic, and one of the world’s earliest tube SDCs. Although the KM54 shipped with nickel-diaphragm capsules, both Prairie Sun’s KM54s had been retrofitted with Mylar-diaphragm KK64/KK84 capsule heads, and had recently been tuned up via Tracy Korby’s REVAMP program. The Schoeps M 221 B is another classic old SDC. It was developed at the same time as the KM 54 (1954–1955), and uses the same Telefunken AC701 tube. The M221B was remarkable in that Schoeps had developed a broad series of compatible detachable capsules, enabling users to swap capsules to best suit the recording task at hand. We used the the M934B, which can switch (mechanically!) between Cardioid and Omni. 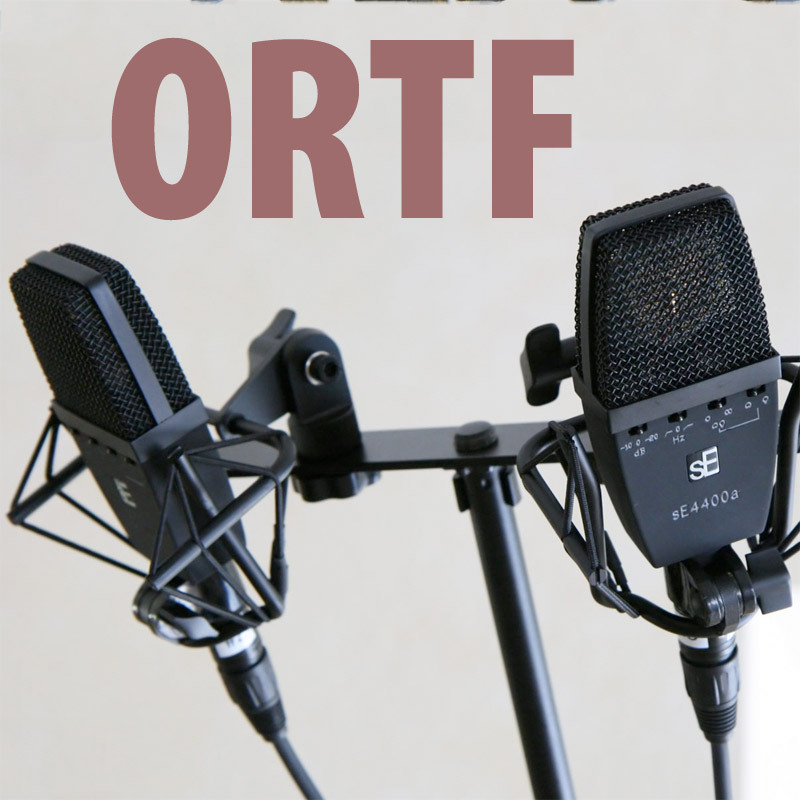 As with the rest of the mics here, we used this mic in Cardioid mode. The Oktava MK-012, as modded by OktavaMod, is in my opinion the best inexpensive SDC on the market, and I regularly recommend it ahead of most sub-$500 microphones. The AKG Acoustics C 460 B, as modded by Jim Williams (Audio Upgrades), is a super-clean, neutral-sounding mic. In some comparisons it comes off as a bit flat, but only because the comparison mics are hyped. It’s a great mic for great sources. I tried to get a pair of Josephson C42, but couldn’t make it happen in time. Same with the beyerdynamic MC-930, which I’d liked so much in a previous drum overhead mic test and only recently returned — I might just need to buy a pair. I wish I’d thought to get the 3-Zigma CHI. Some contemporary Schoeps would have been great too. Still, it was a hell of a lineup, with mics priced from about $700/pr to nearly $3000/pr. And there’s no question that any studio would do very well to have one or two pairs of these as their go-to drum overhead mics. The session was engineered by Isha Erskine, whose credits include Macy Gray, Jeff Beck, and the Black Eyed Peas. 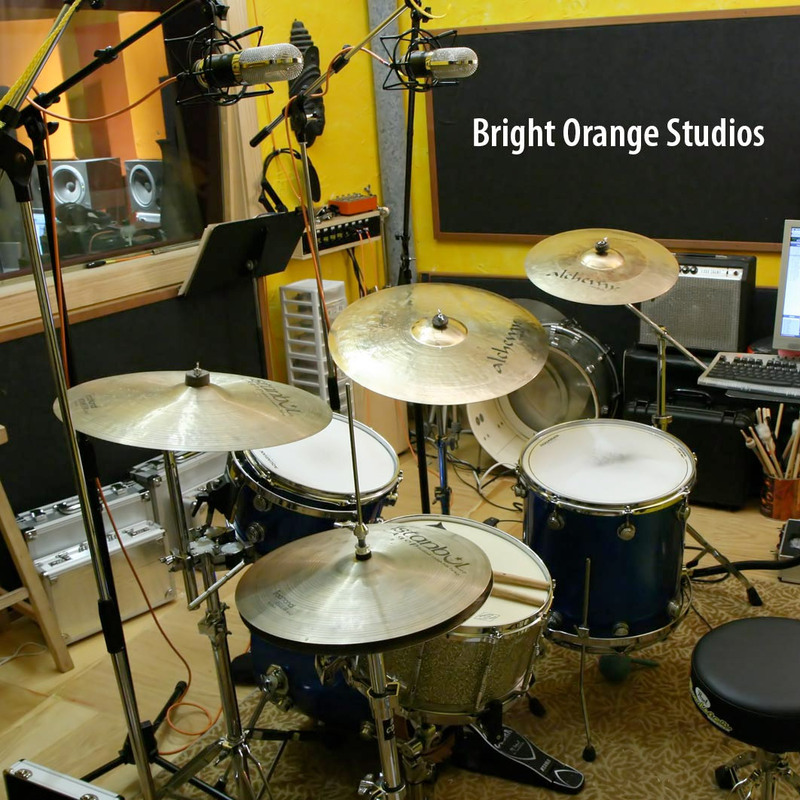 He and the studio interns had set up a DW drum kit in the “Corn Room,” the main live room of Prairie Sun’s Studio C.
At 27'x33', this is a very live space. A half-circle of gobos behind the kit cut back on room reflections somewhat, but there is no mistaking (nor disguising) the sound of acoustic drums in a big room. In the clips below, you will hear that sound. 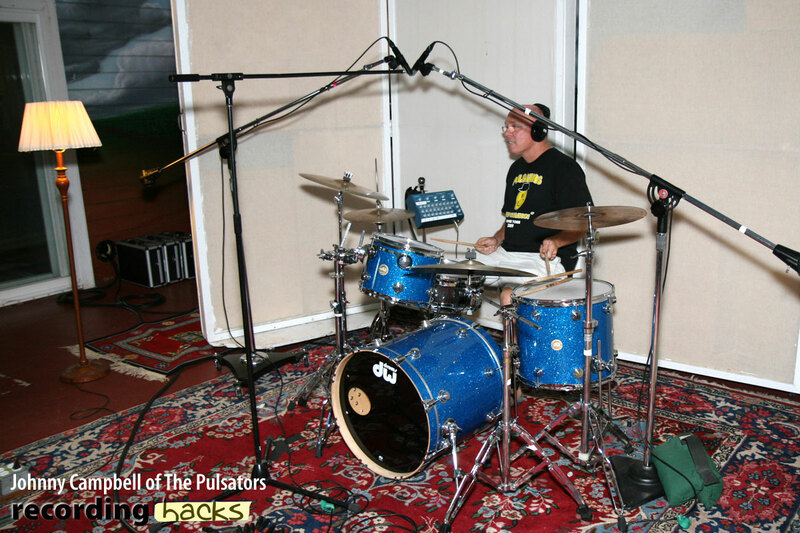 The drummer for this session was Johnny Campbell, founder and main songwriter for local favorites the Pulsators — a band whose earliest work caught the attention of Aaron Neville and led to a string of performances with the Neville Brothers, Little Feat, Taj Mahal, and BB King. Due to time constraints, we chose an XY overhead configuration. This is the fastest to set up, and easiest to reproduce consistently. We used a third mic stand to mark the position in space where the XY array would hang, about three feet above the snare drum. Studio C has a gorgeous Neve 8026 console, which was used only for monitoring in this test. Our preamp was a Millennia Media HV-3D, which fed directly into the converters at 24-bit/44.1 kHz. We adjusted input gain to produce consistent signal levels in Pro Tools. Gain levels changed significantly from pair to pair, and in fact were rarely equal for two mics within any pair. After the session, I fine-tuned the gain levels in Pro Tools so all stereo tracks were at the same perceived volume, exported as 24-bit WAV, and converted to 320kbps MP3 via lame. 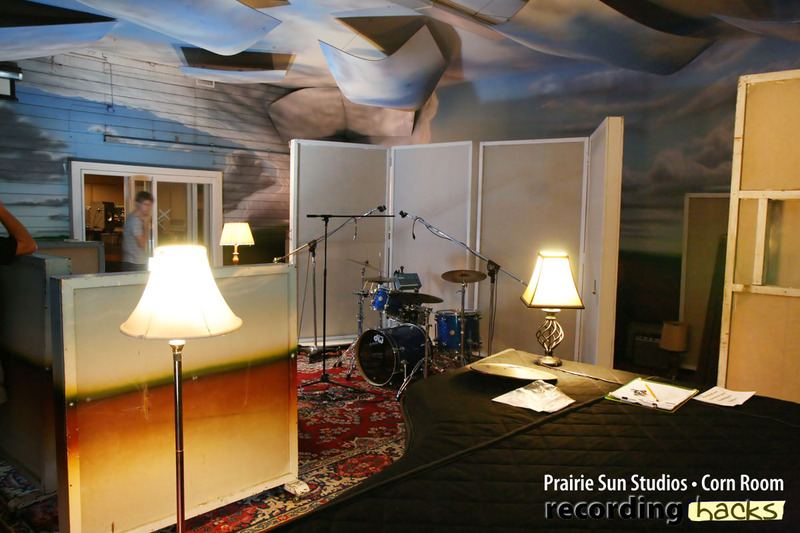 When I heard the Prairie Sun tracks, I knew I’d want to try all these mics again in a familiar space, so I recorded my usual demo track for all the contemporary mics. This second session provides a useful sonic contrast. My so-called “live” room is small and relatively dead, thanks to a generous deployment of RealTraps minitraps and Auralex Studiofoam. For this test I used the RecorderMan microphone technique, about which you can read more in my Drum OH Technique Comparison. Whereas the XY pair at Prairie Sun recorded primarily off-axis sounds, the RecorderMan technique puts most of the drums on-axis. I used a Presonus DigiMax FS preamp, and recorded at 24-bit, 44.1 kHz. The Earthworks SR40, Neumann KM85, Nevaton MC49, and Schoeps M221B seem to have the most room sound. The Oktava MK-012s are the worst offender in this area, where the high end sounds harsh and 4K pushed. The Mojave MA101s’ off-axis almost sounds phased, though this could be mic position. The Milab mics feel flat in that 4k area, but possibly too dark in general. The KM85s seem to have the best transient response, or at least the snare pokes out the most. This is very interesting to me because I’ve used those mics for years and always feel I have too much attack on my cymbals; maybe it’s time to switch it up. The KM54s come in 2nd. The SR40 would come in 3rd. 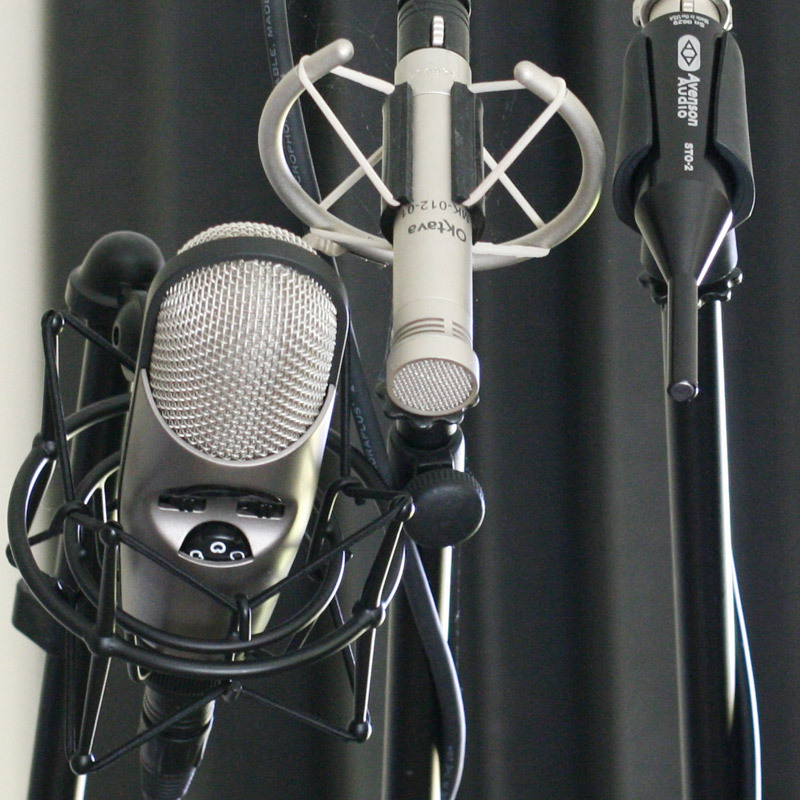 C460B – seem to be pretty neutral, balanced mics. I’d be happy to use them. MA-101 – a little harsh at 4kHz as well, but the drum set has a nice sound. I think they would work well as room mics. KM85 – they have a nice top end, but too much 4kHz. With a little EQ, they work great. MC49 – Nice highs and lows. The kick drum sounds big on these. These would be great room mics, I would think. 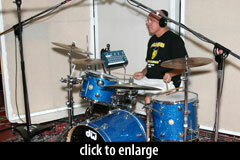 Or great for using only two mics on the drum set. MK-012 – A little dark, but brightened up [via EQ] would work just fine. M221B – the pattern seems too wide; they hear a bit too much of the room for a tight drum sound, making them sound unclear. 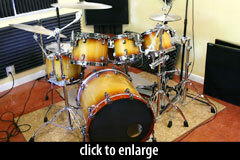 sERN17 – Really nice balanced sound, and tight pattern for a tight kit sound. KM54 – these are the winner for me. They have a perfect balance of room sound, bright and sparkly but not harsh. Isha’s comments were based on the audio from the Prairie Sun session. My comments, below, cover both sessions. Maybe due to my familiarity with my own space, I found it easier to distinguish the mics in the Borrowed Time session. I’ve conducted a number of mic shootouts where the results were so subtle as to be meaningless. That’s definitely not the case here. I can identify about half these mics on a blind listen. I’ll bet you can too, once you know what to listen for. The Neumann KM85 has a low-end rolloff that starts way up at 500Hz. The drums have a nice attack but not so much girth or body. If you want your overhead mics primarily for cymbals, this built-in EQ curve gives exactly what you want. As a close-mic on a hi-hat, this would be a great choice. The Mojave Audio MA-101 FET is equally notable, but for a different reason. The Cardioid capsule has a 6dB presence boost around 6kHz, which to my ear makes the hi-hats so brash sounding that I want to turn the track down. I hear this on both the sessions (with different cymbals). 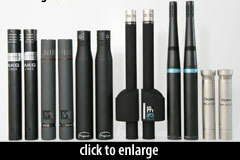 I would have to cut 4–6kHz to use these mics on drum overheads. Otherwise, the drums sound good, and the kick is especially nice. Next most obvious was the Earthworks SR40. These mics comes across as brighter than their frequency graph would suggest. They have great articulation (especially on cymbals), providing a very punchy and forward-sounding track. As with the KM85, the “naked overheads” tracks we’ve recorded do not serve these mics as well as a mix (with close mics) would, simply because alone these mics seem brighter and thinner than most of the rest. In a full mix, with mics on kick, snare, and toms, I think the SR40 would be phenomenal; their natural brightness and detail are appealing, and their excellent transient response provide an immediacy to the drums that I don’t hear from most of the other microphones. The hybrid pair of Milab DC-96B/DC-96C had good body and a really warm, vintage sound. But I agree with Isha that they come off as a little dull on top. In my room, the Milab track seems to lack the excitement of some of the others. I was more impressed with the modded AKG C 460 B than I expected to be. I’ve come to appreciate its unhyped high frequencies and relatively small/directional pickup pattern. It’s not as warm or present as some of these other choices, but oh so balanced and clean! It is a solid contender at a very attractive price. The Nevaton MC-49 had a muscular, powerful sound with a huge kick and tons of warm low end. The high end is a little hyped but very smooth; my hi-hats sound bright and present, not grating or harsh. On Johnny’s hi-hat groove, you could just about punch it in for the KM54. 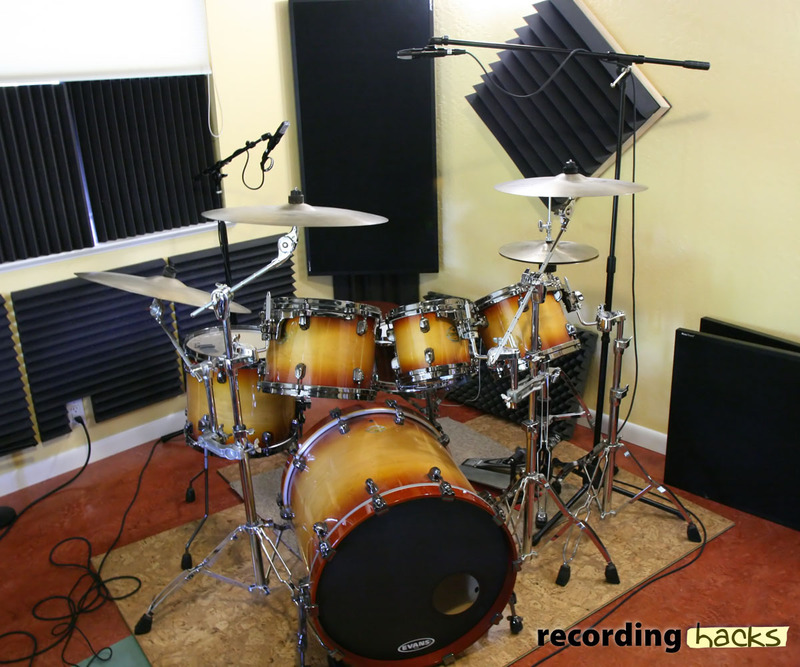 This MC49 a fantastic choice for picking up the entire drum kit with two microphones. The sERN 17 has it all. Every positive adjective I can use for any of these other mics, they all apply to this one. Smooth, balanced, warm, present, articulate… it’s like somebody went through these tracks and EQ’d away every bit of high-end hash and low-frequency wooliness and left behind just the stuff I want to hear. The bottom is tight, like the C460B, but the sERN17 hears farther into the room than the AKGs do. The top is ever so slightly sweeter than “natural,” but not hyped. I would use the hell out of these mics. My compliments to Mr. Neve and Mr. Zhou! My favorite mics from this lineup are the Earthworks SR40, Nevaton MC-49, AKG C460B (modded), and Neve/sE Electronics sERN 17. I think the AKG is the most neutral, and the MC49 the most colored. The SR40 is the most articulate. The sERN17 is the most appealing. I was not so wowed by the vintage mics as I expected to be. I think the KM54s sound wonderful, and if I owned a pair, I’d definitely use them, at least for important sessions. 🙂 But if I were buying overhead mics today, I wouldn’t bother taking the risk of vintage gear — the counterfeits, the unadvertised component swaps, the reliability problems. Several of these contemporary mics sound just as good to my ear. Which brings us back to the point of this shootout. Based on what you’ve heard, can Prairie Sun safely retire its vintage mics? What would you choose to replace them? Please cast your votes in the comments area. We have no affiliation with Milab, Nevaton, Earthworks, Mojave Audio, sE Electronics, Oktava, AKG, Schoeps, or Neumann, and received no compensation for this review. Thanks to Isha Erskine for engineering, to Mooka, Andrew, and the interns at Prairie Sun for hosting the session, and to Johnny Campbell for playing drums. Much gratitude to Dan at Earthworks, Lonya at Nevaton, Evan and Steffenee at Fingerprint Audio, Mattias at Milab, and Dusty and John at Mojave for rush shipping and the use of the microphones. Reviews like this are the product of dozens of hours of work. To help us continue, please consider supporting the site by buying from our affiliates. The Milabs were dark, the Octavas were harsh. To my thinking most of the other ones would be mixable. It could be my ears but I think that with a small EQ tweak most of them would be indiscernible in all but the most sparse mix. Could it be that a decent mic plus good technique equals useable? I tested blind on headphones and wrote my preferences: 2,3,5 and 10 – the rest was fine but had some issues. The only one I really didn’t like was 4 which I found harsh and peaky. Thanks for doing this fine test. What was most interesting for me was that the microphone I liked the best [together with one or two others] was already in my arsenal*. Although some here found them too dark – I don’t! Today I listened to the “recorderman” files and this time I preferred the AKG 460 B, followed by Milab DC-96 [would ideally need a top-lift for this setup] and Se sERN17. The sERN was much more crisp/airy sounding than the others and while I found it a little exaggerated, it was a sweet sounding crisp/air, not strident in any way! The Mojave was a disappointment. 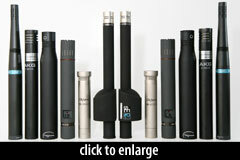 I’d choose any of the ribbon mics from your $60k overhead shootout over any of these. The ribbons are so much warmer and really give the room a more natural character, in my opinion. I was impressed with the AKG Acoustics C 460 B. 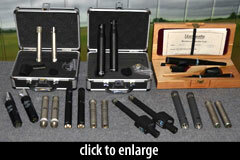 Unfortunately, Jim Williams of Audio Upgrades is no longer offering mic upgrades. So I can’t even get that sound if I wanted to. Bummer! Nice shootout, thanks for publishing. I too loved the 460B of Jim. I never heard his mods before, and I know the originals don’t sound like that. The km54 with 84 caps has the most mojo appeal. I was surprised by the nevaton mc-49. Found them really balanced and would like to try them myself now. Disappointed by the neve/sE and the Milabs. Not at all what i expected. Fr curve is dismembered for the first and too closed up for the last. 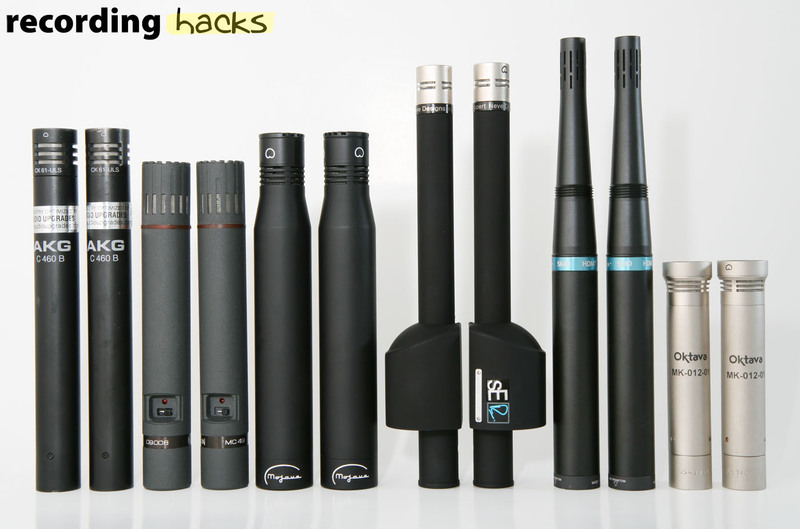 I would like to see a simple sm81 in a shootout at some point, with these more expensive mics. I pulled some out recently, and forgot how good they sounded. I am in agreement, the SE mic sound very nice. Kinda changes my impression of mics made in China. To be fair, I have not tried a lot of them. I picked the Mojave out immediately and it was definitely my first choice, even if it was a bit more brash. There’s something I just really like in the entire Mojave line, even if I can’t quite put my ears on it. I liked the Earthworks next best, followed by the AKG. 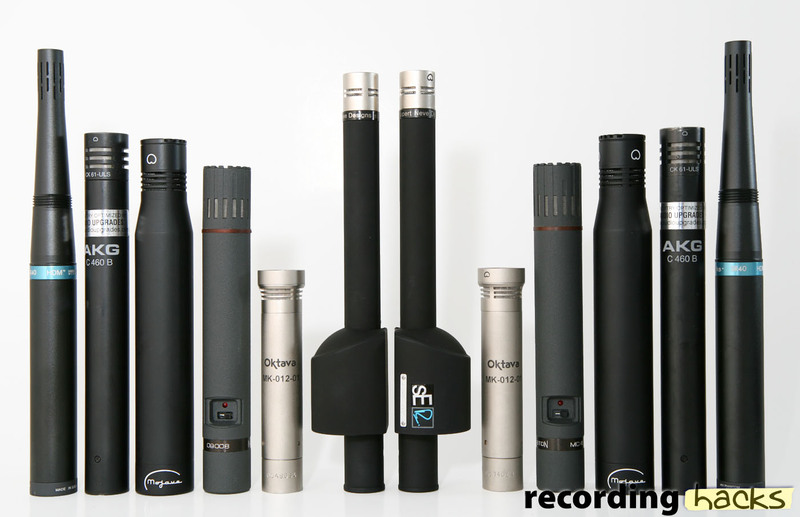 If there are AKG C460B owners who want their mics to be modded, feel free to contact me.